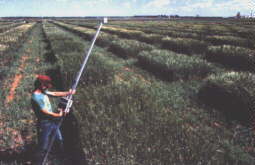 CROPSCAN, Inc. The Multispectral Radiometers are configured into the three following systems. 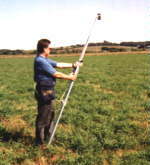 Contact CROPSCAN, Inc. or a Reseller for CROPSCANNER System pricing. 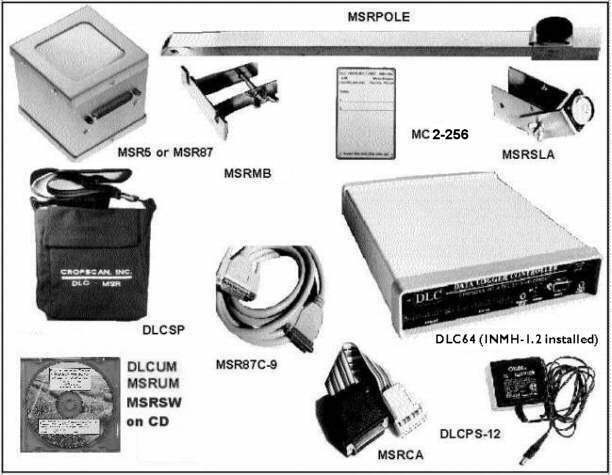 These systems are identical except for the radiometer (MSRSYS5 includes the MSR5 radiometer and MSRSYS87 includes the MSR87 radiometer). Any laptop computer or hand terminal with an RS232 serial port may be used for the operator interface. A CT100 Hand Terminal is available from CROPSCAN, Inc. User can supply computer/terminal. CT100 hand terminal and RS232 cables are available from CROPSCAN, Inc. at additional charge. If CT100 is used then CT100 mounting bracket, CT100B, is also needed. 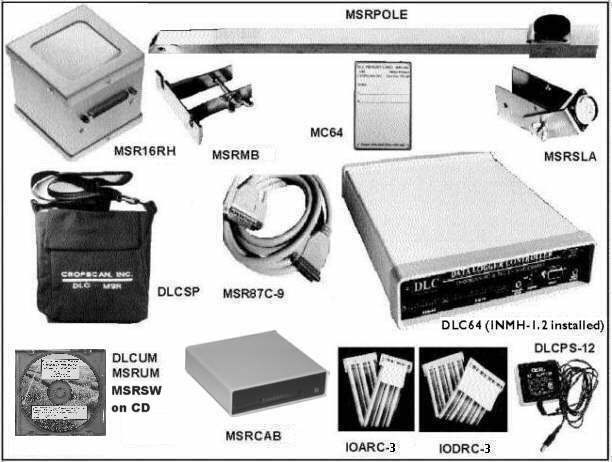 NOTE: The MSR Cable Adapter Box, MSRCAB, can be used instead of the MSRCA to attach up to six external analog-type sensors signals, in addition to attaching the MSR5 or MSR87 radiometer. This system is based on the MSR16R Radiometer and the CROPSCAN Data Logger Controller (DLC). Any laptop computer or hand terminal with an RS232 serial port may be used for the operator interface. A CT100 Hand Terminal is available from CROPSCAN, Inc.
MSR16R Spectral Bands up/down sensors are ordered individually (separately priced). NOTE: The MSR Cable Adapter Box, MSRCAB, can be used to attach up to six external analog-type sensors signals, in addition to attaching the MSR16R radiometer. The data storage capacity for an MSRSYS5, MSRSYS87 or MSRSYS16R system depends on the size of the DLC memory and on the MSR items chosen for recording. The number of DataPoints capacity of the DLC for each DLC system RAM size is shown in the table below. To determine the DLC memory size for your application you will need to determine how many plots, subsamples per plot, and the number of items to be recorded for each plot. An example follows to help you determine what memory size DLC you may need for your application. For the MSR5 radiometer channels may be 1-10 (10 total). For the MSR87 radiometer channels may be 1-16 (16 total). For the MSR16R radiometer channels may be from 17 up to 48 (32 channels total). You may choose any of these items to record. DATE, TIME, IRR, PLOT#, AND SUBSAMPLE# ARE ALWAYS RECORDED. For the MSR5, channel 15 (radiometer temperature) is also recorded. For the MSR16R, channel 3 (radiometer temperature) and channel 4 (ground mV) are also always recorded. Each item requires one datapoint of storage per recording scan. The minimum number of datapoints per scan for an MSR5 is 6, for an MSR87 it is 5 and for an MSR16R it is 7 (because of the always recorded items). A typical RECORD list for an MSR87 might be: DATE,TIME,IRR,PLOT#,SS#,1-16 or 21 datapoints per recording scan. For an MSR16R the channel range might be 17-32 for 8 wavelengths instead of 1-16 and it would require 23 datapoints instead of 21 because channel 3 (radiometer temperature) and channel 4 (ground mV) are also always recorded, as stated above. An MSR5, with all channels 1-10 for 5 wavelengths and channel 15 for temperature would record 16 datapoints per scan. For other configurations the plots storage capacity will vary accordingly.